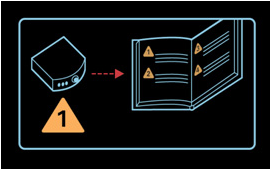 When you encounter an error while setting up the Linksys Media Extenders, you will see a picture of the Extender and a book, with a numbered triangle in the lower left-hand corner. 1 The Extender is malfunctioning. 2 The Media Center Extender’s software image is damaged or missing. Restore the Extender’s software image. For instructions, click here. 3 The Extender’s software image is faulty or the Media Center PC is not in the proper mode to restore the Extender’s software image. 4 There is a problem with the Ethernet network cable connection. Make sure the network cable is properly connected, or replace it with another one.